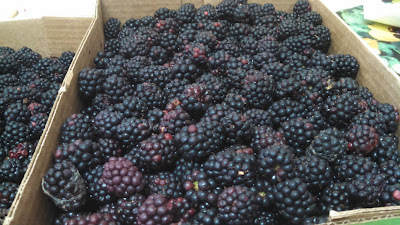 A generous neighbor presented us with a gallon of blackberries late Friday night. 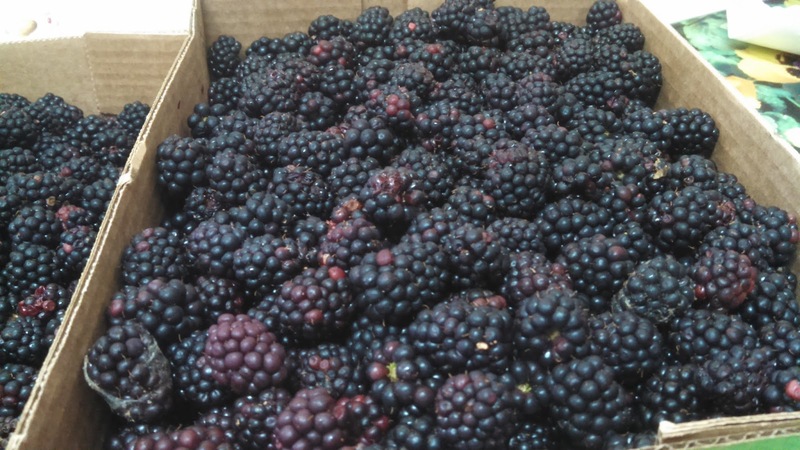 It was a complete surprise and brought a flood of childhood memories of going to the blackberry patch down in the pasture with my grandparents on hot,steamy July days. When going to the blackberry patch, I was always cautioned to watch for snakes but not one word of caution about those chiggers! It was well worth the discomfort for the reward of blackberry cobbler, dumplings or jelly that followed those picking experiences. I don't think I will ever match my grandmother's blackberry cobbler, but Mountain Blackberry Cobbler comes pretty close. The recipe is found in the Junior League of Springfield,Missouri's cookbook, Sassafras!. Preheat oven to 350 degrees. To prepare crust,mix 2 cups flour,1/4 cup sugar, salt and shortening with a fork until crumbly. Add enough water to make a soft dough. Divide dough into 2 parts with slightly more for bottom crust. On a heavily floured board, knead dough until smooth. Roll each portion of dough to 1/4 inch thickness. Arrange larger portion of dough on bottom of a greased 8x10-inch baking dish. Set aside. In a medium bowl, mix 1 cup sugar and 3/4 cup flour with a fork. Pour berries into pastry-lined baking dish. Sprinkle flour and sugar mixture over berries; dot with butter. Place top crust over berries and crimp edges. Cut slits in decorative pattern in dough to release steam. Bake 1 hour. Serve warm. Serves 10 to 12. Hi, I have see and read your post, this is an excellent post. Thanks for share with us.